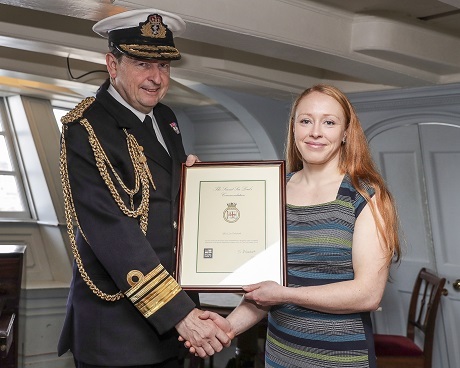 Frazer-Nash Group Leader, Lisa Pritchard, has been awarded a prestigious Second Sea Lord's Commendation. Lisa was presented with the award by Second Sea Lord, Jonathan Woodcock OBE, in recognition of her outstanding achievements as the Systems Requirements Engineer within the Defence Equipment and Support's (DE&S) Fleet Solid Support (FSS) project. This highly complex project will be providing the Royal Navy with support to, and sustainment of, maritime expeditionary forces. Lisa's role involved developing the system requirements for the FSS platform. Lisa said: "I was thrilled to be awarded this commendation in recognition of my work on the FSS project. I very much enjoyed being able to apply my wider systems engineering expertise to support the project team. "I would like to thank the wider Frazer-Nash requirements team for their support." Lisa received her award at a ceremony aboard HMS Victory, which was followed by a luncheon at Admiralty House. Vice Admiral Woodcock's commendation recognised Lisa's 'commitment and flexibility' and said that she had: "worked tirelessly in advancing the understanding of the wider systems engineering hierarchy and the tools and techniques which can be applied to help continually progress its development." Technical Department Head, Gordon Anderson, said: "We congratulate Lisa for this well-deserved and prestigious award, which recognises the quality of the hard work, dedication and professionalism that she provides, not only to our naval customers but across our client base."